June 23, 2016— Women in science, technology, engineering arts and design, and math careers earn 33 percent more than their non-tech counterparts, so to encourage more girls to enter these fields, Georgetown has joined a new global effort to reach them at a young age. The effort, called TeachHer, is lead by the United Nations Educational, Scientific and Cultural Organization (UNESCO) in collaboration with partners, including Georgetown University’s Center for Child and Human Development (GUCCHD). 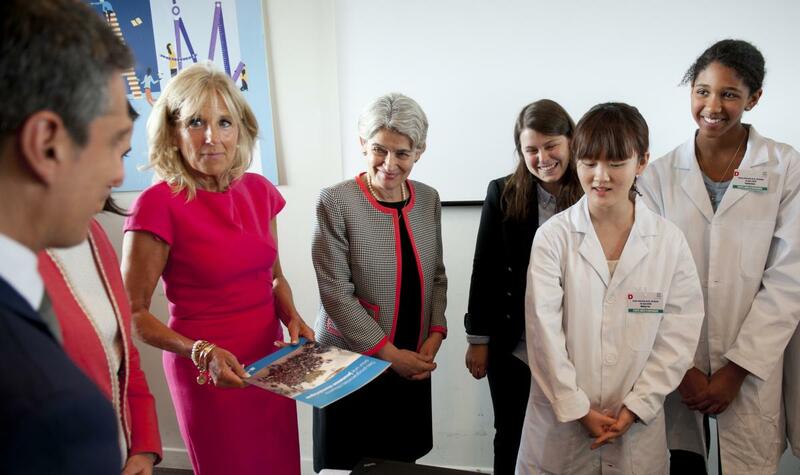 Magrab and her UNESCO colleagues hosted representatives from about 50 interested countries at the launch of TeachHer in Paris earlier this month. Jill Biden, D.Ed, represented the US in support of the program. She was joined by the First Lady of Costa Rica, Mercedes Peñas Domingo. TeachHer aims to expose girls in middle school toSTEAM opportunities. When girls leave middle school without being exposed to the opportunities that math, science and technology offer, they are unlikely to pursue careers in those fields. So how do you reach middle school girls? TeachHer believes the answer starts with the teachers. If teachers have the skills to help girls overcome gender disparities in STEAM, more girls will enter those fields, benefiting themselves and their families, said Magrab. Costa Rica and Ethiopia will be the pilot countries for TeachHer, sending a group of teachers to the trainings held in their countries. Magrab says that GUCCHD will be responsible for providing input to the curriculum creators and organizing the groups that will be facilitating the training in-country. “We are trying to reach out to as many people as we can to find resources that could be put together in a culturally relevant way for both Africa and Latin America, and we will be including input from those in the GUMC community who have been involved with STEAM education in elementary schools and junior high,” Magrab says. It is well known that there are gender disparities in STEM fields in the United States, but Magrab says that the United States has narrowed that gap. Magrab believes it is fitting for the Georgetown to be a founding partner of this effort.